Since the poker boom in 2003, film makers have tried to create a movie that resounds with the poker community much in the way that Rounders has. Unfortunately, many of those movies have either fell well short of the mark, or had no clue what the game really was all about. 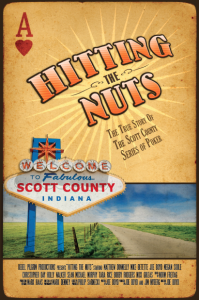 Last April, independent film producer and director Joe Boyd released a film entitled Hitting the Nuts: The True Story of the Scott County Series of Poker. At first glance, this films looked to be a low budget attempt to cash in on poker’s popular. However, after watching the film, many discovered that this cast of unknowns had actually properly captured the spirit of the game. The story centers around the players who play in Scott County’s annual poker tournament and about half of the film is spent giving you backstory on the characters. One of the main characters, Ezekiel Yoder, is an Amish farmer who had lost everything and was trying to play in the town’s annual poker tournament to save his farm. Carol Marshall is a middle-aged waitress who is flirty, spunky, and a helluva poker player. Dean Livy is the film’s “Phil Hellmuth.” He is the “defending” champion by default when the previous champion died. Without spoiling too much about what happens in the movie, suffice it to say that things do not go as expected in the poker tournaments and hijinks ensue. Characters grow and develop and many of the players learn that the best part about the game of poker are the bonds and friendships you develop during the game. As far as the actual poker is concerned, it would be best described as what you would expect to see from a low stakes, hometown poker game, which works perfectly for this film. The filmmakers take care to even throw in things that you would expect at a hometown game, such as the “crazy cat lady” who has no clue how to play but still manages to luckbox her way into some money. Many have compared Hitting the Nuts to the poker flick “The Grand” but in honesty, this film is much better. It tells a story about poker on a level that almost every person who has ever played the game can relate to. You won’t see big name pros or huge amounts of cash splashed around. What you will see is a hilarious film that shows what the game really is for most of us and not what you see on television.